Xbox One X Owners will get 4K patches, even if they don't own a 4K TV. The Xbox One X packs in a 1 TB hard drive, and it sounds like you'll need the space, as Microsoft has confirmed that any game that has 4K support will download 4K assets, no matter what sort of TV you have. Speaking with Stevivor, a Microsoft rep said that each console will download the appropriate assets for its capabilities. The rep says, "With the launch of Xbox One X, when it comes to game content our intention is to download the correct assets to the correct console. 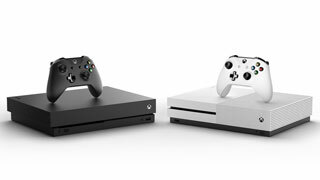 This means, regardless of the TV you are playing on, 4K assets will be downloaded to Xbox One X (if available) and the standard 1080p assets will be downloaded to an Xbox One S."
Microsoft also says that it is planning to give developers tools that will let them "make downloads more efficient," on both Xbox One S and Xbox One X. "As part our developer readiness for Xbox One X, we have made available a feature which will give them significant flexibility when it comes to what gets installed on a user's console. In addition to 4K specific assets, developers have options when it comes to language specific assets as well, which depending on the title, can drastically reduce the install footprint. This ability to intelligently install the best assets for each console and language are available on all Xbox One devices, and it will be up to the developer of the game to determine the specific implementation." There's been no word on what the file size difference between 1080p and 4K assets, but it sounds like it could vary based on how the developer approaches its patches. Luckily, the Xbox One supports external drives, so if you run out of room, you can expand your storage that way.